We saw some fantastic football on Sunday. We also saw some crazy weather on Sunday with plenty of cold temps and certainly a lot of snow. So for all of those folks that worry that a cold Super Bowl, even a blizzard Super Bowl, would be disastrous, I think they need to wake up and smell the roses. Here are my Week 15 picks. Denver got off to a sluggish start against Tennessee on Sunday, but you wouldn't have known that if you just looked at the box score, as they raced off to a big victory after trailing by a point at halftime. With how potent their offense is, with the ability to put up points at will, particularly in the second half, they are a tough out. Philip Rivers is going to have to be flawless, as will Keenan Allen and Antonio Gates, and even then, it probably won't be enough. Frisco got a pretty big W on Sunday against the Seahawks and while their offense was not great (whose are against Seattle), their defense was fantastic once again and they were able to slow down the prolific attack of their opponent while getting just enough offense for the win. They have won three in a row and they appear to be rolling towards the playoffs, although they are no lock yet with Arizona just a game behind them right now. Meanwhile, Tampa's defense was sharp against sagging Buffalo but it will be tough to replicate their offensive output this go around with the 49ers. It has officially hit the fan for Washington as they put together a pathetic display at home against Kansas City and were out of it immediately. It's never a good sign when the score was closer than the game really was, and you lose by 35. Not to mention all the drama surrounding Mike Shanahan and the reports he wanted out in January because of the close relationship with their clown owner and Robert Griffin. And playing a Falcons club that are in no hurry to win in order to solidify a high draft pick means the despair will continue. In what was certainly a tough game and a crucial contest in the divisional race, the Seahawks fell for only the second time this season against the 49ers. If you are a Seahawks fan, you need not worry because they are in great shape to run right through the NFC Playoffs. Their defense is fantastic, their offense can be very prolific and now that they have suffered a close loss, they will be hungry now to prove themselves at the top club around. And fortunately for them, the Giants are awful. That Eagles win amid the epic snow on Sunday not only was extremely fun to watch, it also showed that Chip Kelly's offensive attack can succeed even in awful weather conditions. Even so, I think they'll be happy to be playing indoors, which makes their offense even scarier to imagine. Minnesota's defense is a mess and thus their only hope would have been Adrian Peterson, and he may after all thanks to his injury not needing surgery, but I highly doubt it. And while I do like Toby Gerhart, he's not that good of a back to keep Philadelphia at bay. The Eagles are my Lock of the Week. Marc Trestman is saying the right things about how the quarterback job is Jay Cutler's when he comes back, as it should be, no matter how good Josh McCown plays. That said, I doubt that Cutler will be back this week and with how good McCown is looking, I don't think it will be much of a problem. After all, Cleveland has lost four in a row even with Josh Gordon in God mode, although they really should have beaten New England last week (and that botched pass interference call certainly didn't help matters). Give me Chi-town. UPDATE: Cutler will be starting after all, but that won't make me change my prediction. It probably makes more sense to pick the Jaguars here. After all, they have somehow won four of five, while the Bills have won two of nine since starting 2-2. And Buffalo really looked terrible on Sunday in Tampa with no running game and Manuel throwing a hearty four interceptions with zilch in the touchdown department. But I do think the Billikens are the better club despite their ineptitude of late and I think they'll keep the W in the River City. So now what for Houston? With Gary Kubiak getting the axe and Wade Phillips manning the ship for the balance of the season, is there any chance they turn things around and get back some pride? I say no, but fortunately, with how the Colts are playing of late, they will have a shot. The Colts looked terrible in Cincinnati, save for a strong performance by Andrew Luck, as their defense failed time after time to slow down the Bengal attack. Fortunately, there is no Houston attack, so there's that. It is safe to say that it is never safe to say the Patriots are out of any game at any point. For the second time this season, the Patriots have uncorked some serious late game heroics at home to crank out victories that have no business being there's. Of course, there was that atrocious pass interference call they took advantage of, but to be fair, that call didn't cover the earlier onside kick for them. The road will be tougher now that star tight end Rob Gronkowski is out for the remainder of the season, plus Miami has a whole lot to play for, but I still feel safe going with New England. I will give credit where credit is due, Geno Smith looked significantly better during the Jets' big victory over Oakland and more importantly, he played with confidence. Say what you want about Oakland, that's big as he had lost all of his confidence during their three game losing streak and now they still are alive to get to the playoffs. That said, this is going to be a very tough game for them against a fantastic Carolina defense on the road, where they have struggled all season long. The headlines coming out of Landover, besides those pathetic crowd shots, has been the disaster that is the Washington club, and that probably is not fair to the Chiefs who came in and truly kicked their asses. Jamaal Charles are tremendous and the defense was as rock-solid as usual. Kansas City may have their flaws, but they are making some headway as we have reached the final month of the season. Meanwhile, Oakland has won once since October, so there going the opposite way. It will be closer than some expect, however. Arizona is doing what they have to do to give themselves a shot at the playoffs and that is the old fashioned way, winning ballgames. Their defense is very strong and they really get after the quarterback, which is not a good sign for Ryan Fitzpatrick, even without the excellent rookie safety Tyrann Mathieu who was lost for the balance of 2013. The Cardinals' offense has shown some pop in the passing game and should find some holes in a less than stellar Titans pass defense. I would never rule anything out, but Arizona seems like a good call. After their demoralizing demolition in Seattle, New Orleans rebounded in a big way on Sunday by smashing the Panthers at home. They helped to solidify themselves as one of the teams to beat, but we knew that anyways. I expect them to look like they did last week, even against a solid Rams defense that can pressure the passer, as they have always been an excellent club indoors. And can we really count on Kellen Clemens to move the ball with Drew Brees? Put a gun to my head, and I'll tell you that I don't think Aaron Rodgers will play this week, even with the heightened odds in the NFC North after the loss by the Lions and their own win over Atlanta. Matt Flynn did look better, but let's confuse the Falcons with a good defense, eh? I think the Packers have a concern with their defense as they did give up some yards on Sunday, and that will not bode well against Tony Romo and friends down in Arlington. I think it will be a game before Dallas pulls away late. For the second week in a row, the Steelers lost a game that they really would have liked to have as they now are in danger of falling out of the playoff race completely, no small feat in the AFC. Meanwhile, Cincinnati looked tremendous in smoking the Colts at home, and with three wins in a row, they are going in the right direction and potentially live up to my preseason pick of them going to East Rutherford. But I think Pittsburgh is due and I just can't see them withering away when their playoff hopes are becoming dire. 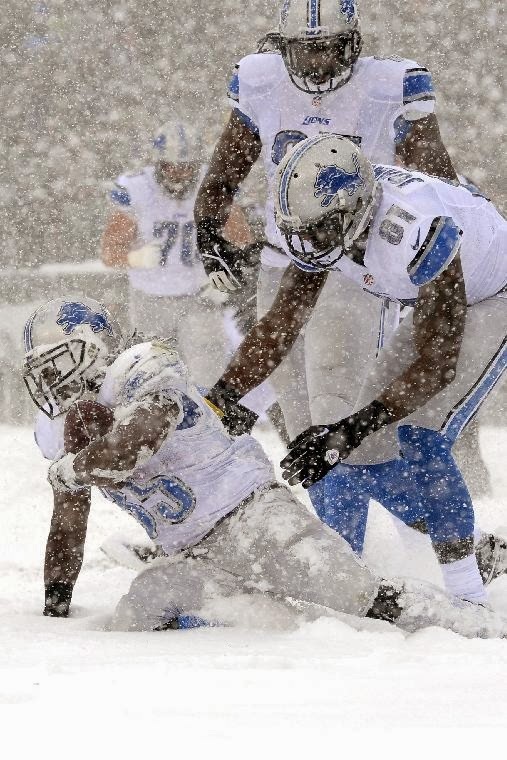 These two found themselves at the opposite ends at their respective Winter Wonderland contests, with the Ravens pulling out an extremely wild finish to take out Minnesota while the Lions continue to let their control of the NFC North fall apart as now, they are tied with Chicago with Green Bay, somehow, within a half of a game. I do think a return to their friendly confines will mark a better performance, as well as a key victory over the Ravens, who are not equipped to take part in an offensive shootout.